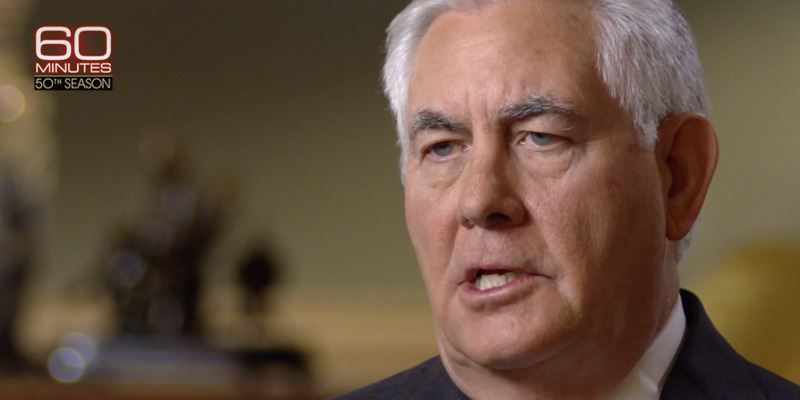 During an episode of “60 Minutes” on Sunday, Rex Tillerson hailed the US’s North Korea strategy. The Trump administration has been pursuing a “maximum pressure” approach to Kim Jong Un’s government that Tillerson said was bearing fruit. He said that the US could soften its approach – but that Pyongyang must blink first. The US will keep up its “maximum pressure” approach on North Korea, according to Secretary of State Rex Tillerson – but could be prepared to relent if Pyongyang blinks. Tillerson told CBS News’ “60 Minutes” in an interview that aired Sunday night that the Trump administration’s tough approach to Kim Jong Un’s government was already bearing fruit. “Well, that’s who we will have to work with to achieve this diplomatically. What we have to determine now is are we even ready to start? Are they ready to start? Tillerson discusses North Korea around 0:58 into the video below. The US Treasury Department and the UN Security Council have passed multiple rounds of sanctions on entities, people, and companies affiliated with North Korea’s government over the past year. North Korean vessels have been accused of violating them at least three times since September, however. Tillerson’s message echoes that of Vice President Mike Pence, who told The Washington Post last week that the US was pursuing a policy of “maximum pressure and engagement at the same time” with Pyongyang. The US is said to be considering a “bloody nose” strike on North Korea, in which it would respond to the next North Korean missile or nuclear test with a limited military strike designed to embarrass the country. State Department officials and senators have rejected those claims.